It’s finally starting to feel like summer outside and many of us will be pleased to leave those chilly, winter nights behind and enjoy the longer, lighter evenings. Although the summer can be a fun time, with the children off school and lots to do outside, it is prudent to be aware of the risks that come with the warmer temperature, such as dehydration, hyperthermia, heat stroke and heat exhaustion. It’s true that the summer heat can be dangerous to anyone but elderly people, especially those with health issues, need to be especially careful. This article will take you through some practical guidance for avoiding heat-related illnesses so that you can still enjoy the long summer days with your family and friends. Staying well hydrated is important all year round, but in hot weather it’s more important than ever. 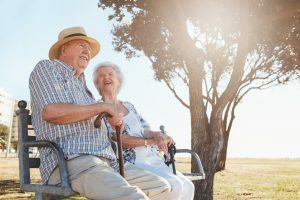 As or bodies age, our ability to regulate temperature through our sweat glands and blood circulation tends to decrease and dehydration can deter our body’s natural cooling temperature further. Drink regularly and try to limit your caffeine and alcohol intake as this can make dehydration worse. Adding some ice and fruit, such as strawberries and lemons, to your drink makes a delightful refreshment! People who suffer from dementia can often forget to keep drinking, especially if they live alone. If this is a family member or a friend of yours, please do take time to check in on them to make sure they are drinking enough and have easy access to water – cups next to the tap or bottles of water kept in the fridge are a couple of suggestions. Some symptoms of dehydration are; headaches, dizziness, low volume of urine which is also darker in colour than normal, dry mouth, skin, lips and eyes and tiredness. Dehydration is the main cause of heat exhaustion so if you are feeling dehydrated, take on plenty of fluid and make sure you get plenty of rest. Severe dehydration is a medical emergency and requires immediate medical attention. It’s not unusual to have a reduced appetite when the weather is warm, however it is vital to keep well nourished. When we sweat, we lose salt from our body so we must eat regularly to replace the salts we lose from sweat. Salads, vegetables and fruit are particularly great to fill up on, as well as containing much needed nutrients, minerals and vitamins they also have a high water content. Avoid wearing tight or restrictive clothing that can become uncomfortable in the heat and instead opt for loose-fitting, light-weight, light-coloured, cotton clothing. Remember to also where comfortable footwear with sturdy soles and make an appointment with a podiatrist or chiropodist if you are suffering from any uncomfortable foot problems. When you are out and about, don’t forget to bring your sunglasses to protect your eyes and a wide-brimmed hat to keep the sun from your face. When taking a bath or shower, make sure the water is not too hot. Splashing your face regularly with cool (but not cold) water is a nice way to freshen up throughout a warm day, as is placing a damp sponge or flannel against the back of your neck. You can also take one of these with you if you are visiting friends or family. When indoors, you can keep your rooms cool by drawing the curtains or blinds of any windows that catch the sun and turning off any lights as these generate heat. We always suggest keeping a list of emergency numbers readily available, this could be in plain sight and stuck to the fridge and a copy in your purse. Be mindful that during the summer holidays, when the children are off from school, friends and family may be away for a period of time so make sure you know who will be around should you need to contact them. The hottest time of the day is between 11am and 3pm. If possible, you should avoid going out or undertaking any strenuous activities, such as housework and gardening, during this time. If you do need to go out, do not over exert yourself, stay in the shade as much as possible and drink more than you normally would. 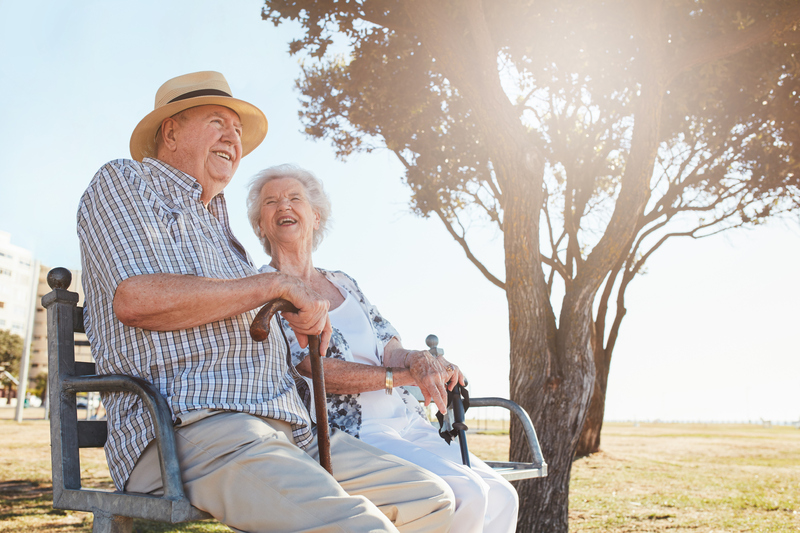 The summer is a wonderful time to take gentle walks outside and you can keep yourself safe by carefully planning your outdoor adventures, whether you’re attending a family barbecue or watching your grandchildren play in the park. If you need some assistance, there are many mobility aids that you can purchase or hire. If you are travelling in a car, keep the air conditioning on or the window open and never sit too long in a parked car as they can heat up very quickly. Keep some sun cream, bug spray and a bottle of water to hand in your bag. Consult your GP regarding how the heat could affect any medication you may be taking and any possible side effects. A lot of medication needs to be stored in a cool area and away from direct sunlight, so be sure your check the storage information. If you keep in mind the simple adjustments we’ve mentioned in this article you can make the most of the lovely weather. If you need any help in selecting mobility equipment and exercises to build up your strength so that you can feel confident in going out, please contact us – our physiotherapists are happy to help.